StellaEM Haberdashery Home | About Us | Opportunities | Sponsorships | Contact Us! A couple of weeks ago I had the privilege of meeting Desiree from StellaEm Haberdashery. I was instantly drawn to her Etsy shop because not only does she work with some amazing colors and patterns, she creates super dapper pieces for men both young and old. Her shop made me realize that we don’t often spotlight items for men-in-progress here, so I was really excited to put her work on the site! I hope you enjoy the interview and her work! Well, I’m married to a pretty ridiculously brilliant (and handsome!) man. We have two bright and comical children (son-3; daughter-1). Pre-children I was a college English Instructor, torturing students with 10-page composition assignments and poetry discussions; now I’m a stay-at-home-mom, endeavoring to raise, simply, a gentleman and a lady. I adore: a good novel (or even a mediocre one—reading is reading! ); spin class; new recipes (my husband would probably tell you I rarely make the same meal twice); fruity beers (though I’ll take any brew as long as it’s cold); singing like I’m Adele (though I can assure you I am not); sweet tea; coffee; and warm, sunny days. If I’m cutting out ties, I’m probably watching Downton Abbey, Sherlock, or some ridiculous 90s sitcom via Netflix. stellaEM is a mom & me name mashup. My mom’s first name was Stella, though she went by her middle name. The first two letters of my middle name are EM. I wanted to include Mom for so many reasons, but the main is memory I suppose. Mom introduced me to sewing when I was a very little girl (maybe four years old). She was exceptionally talented; I believe she’d dreamed of becoming a fashion designer, but life, as it does sometimes, went a different direction. Because she died when I was 14, I never really had the opportunity to tackle serious projects with her, so by putting her name on my work I’m sharing this venture with her. Something we see in artisan and handmade shops often is legacy and deep personal meaning. It’s really great to see those sentiments come to life in a craft! What got you started in designing and creating the pieces in your shop? It’s really simply a story of filling a need. When my son was about a year-and-a-half, I bought him a seersucker suit and the only bow tie that was available in the store (a boring navy blue diamond number). He pulled the thing apart after just a few wears. I knew there had to be something better, but so many of the ties online were either not made with a little boy in mind (I can tell you that a Velcro closure will stay on a little boy for all of two minutes), or were made in stuffy, conservative fabrics. So I pulled out my fabric stash and churned out a set of bright, somewhat funky ties befit for a little boy (in both construction and design). Somewhere along the way I had an impulse to start and Etsy shop, and so stellaEM was created. I had intended to only create boy’s ties, but after several custom order requests for men’s neckwear, I decided to expand my offerings. There is so much amazing work in your shop! 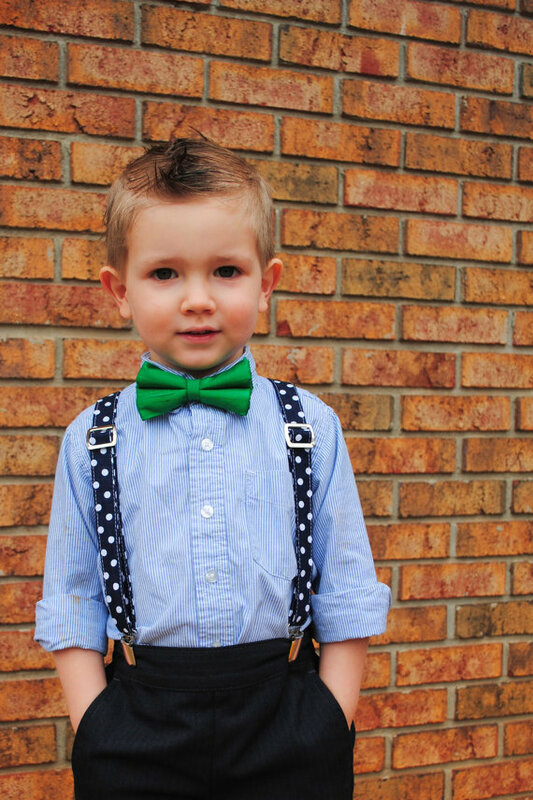 My son’s favorite item is the navy polka dot suspenders. 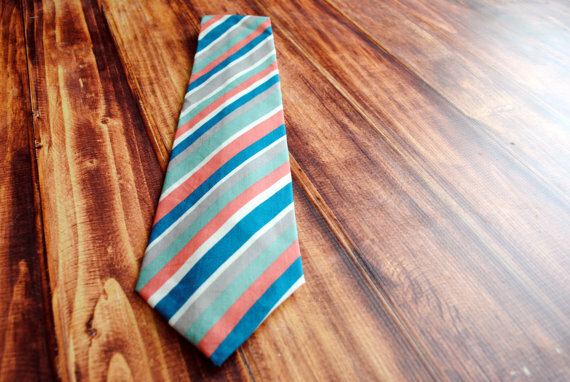 They’re a fun neutral, coordinating with a number of ties. I am just smitten with the gingham fabric. It is available in 20 colors, but my favorite is the plum. The fabric has a beautiful weave and soft feel. I’m giddy each time I work with it. 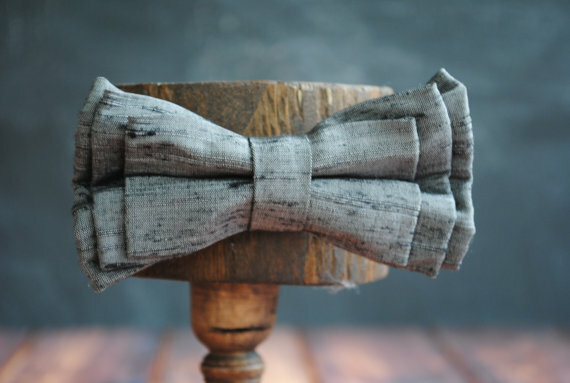 Last year I was selected to participate in the NotWedding in Athens & designed this tie for the occasion. I wanted something unique, yet subtle. This design can be applied to any of the fabrics in my shop. 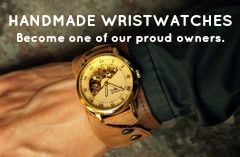 Given that you’re an artisan yourself and a supporter of handmade goods, why do you think choosing handmade is such a great idea for men, people shopping for them, and for everyone? All of these qualities work together to make handmade the perfect option for gifts. Often, finding the perfect gift isn’t a challenge because you don’t know the person, it’s because you can’t find something that is just right in the stores. 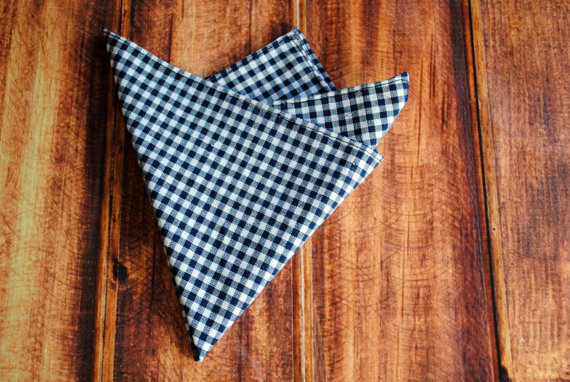 Through handmade, you can take an active part in creating the perfect thing—in my case, neckwear—for your intended guy. Thank you so much for taking time to share your amazing work with us! 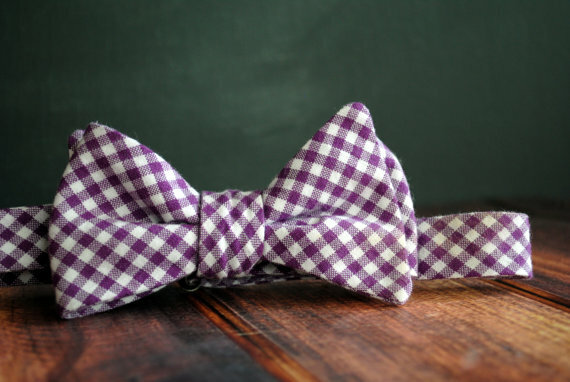 Tagged bow ties, Boys, Haberdashery, interview, StellaEM, Ties. Bookmark the permalink.